Boy greedily eats potatoes. Boy has breakfast. Boy greedily eats. Hungry black boy. Boy eats on nature. Happy boy. Boy is greedily eating chicken. 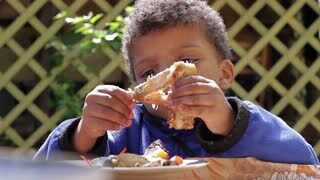 Child in an orphanage appetizing eats meat. Kid has lunch at the table. Funny child. Happy boy.